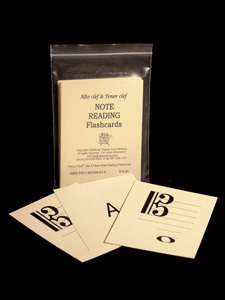 By () - Alto Clef & Tenor Clef– 41 cards. Both clefs include three ledger lines above the staff. Alto clef drill also covers two ledger lines below the staff. Tenor clef drill covers three ledger lines below the staff. All ”flashcards for the private teacher or small group” are printed on 4 ¼ x 5 ½ colorful card stock, and are perfect to use in a private lesson or small group setting.